The other day my friend Lynda asked me if I would make a birthday cake for her daughter who was turning 3. 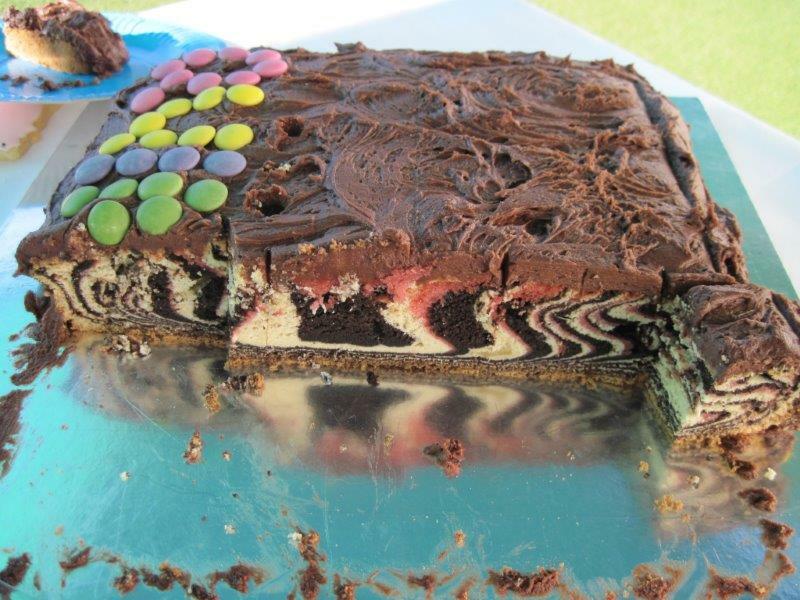 She was going with an animal theme and had come across the idea for a zebra-striped cake – the first time I’d heard of such a thing. Needless to say I was excited to experiment and after some research on the method, I came up with a variation that I thought worked. This recipe is perfect if you want to impress without putting in too much effort. It’s really easy because you’re using (ready-made) puff pastry, and just adding filling and topping. After all, how wrong can you go with cream and chocolate? Of course if you want to be adventurous and make your own pastry, feel free. I should warn you though that puff pastry is one of the most challenging to make yourself. I also make something very similar using choux pastry, which ends up as éclairs with either cream or a lemon-flavoured filling and chocolate on top (or not). It takes more effort though as choux pastry is best made at home and the lemon filling requires several steps, although it’s well worth it for the result. One day I’ll post that recipe too but for today, we’ll go simple. This is one of my favourite dessert recipes as it’s somewhere between a mousse and a cheesecake – two of my best things! For years I’ve made it in a simple, dark chocolate version, then recently I decided to experiment with a tri-colour collection of dark chocolate, vanilla and strawberry. Because you’re working with three different flavours, you need to pay close attention to each step and do a bit of multi-tasking (which is why this recipe is classified as medium to difficult), but it worked really well and I think is well worth the trouble for a special occasion. Serve it in small bowls as it’s quite rich. For those who aren’t feeling so adventurous, I’ve also included here the simpler, dark chocolate version, which is totally delicious on its own. Or you could check below for how to make the vanilla or strawberry versions instead. Each flavour is quite easy on its own – it’s just when you’re making three at once that it becomes more complicated.